As you look through the family charts you will notice connections with other families with the Wilson surname – there are three or four such connections – not so surprising given the name is pretty common. All are from different Wilson families. William Sorell Wilson, oldest son of Bonnie William married Eliza Wilson at O’Brien’s Bridge north of Hobart in 1856. Eliza was the daughter of William Borrodaile Wilson and Grace Terry. Grace was the daughter of John & Martha Terry of New Norfolk, owners of Lachlan Mills on the Derwent, their nearby home today being a very high quality and well known B&B known as Tynwald – an image of which, compliments of Betty & Eric Judd, is shown below. William Borrodaile Wilson arrived in VDL around the same time as did our Wilsons – his family came from England and were significant property holders from near Nottingham. Having significant capital he received a large land grant on the Derwent River at Gretna near Hamilton and here he built a substantial farm (he called it Clarendon on the Derwent) in which he and his family of five boys and six girls, lived for a number of years until, laden with debt, he became insolvent due apparently to a series of poor years of harvests coupled with excessive involvement with bloodstock activities. The Borrodaile property shown in its beautiful panoramic setting on the Derwent, appears in the Header above. A closer image of the homestead is attached below; it remains, externally at least, largely as it was in the 1820s. We included it in the itinerary of our 2005 family group Tassie tour; our Tasmanian cousin Dianne Hallett being well known to the present property owners kindly arranged for our visit there. Regrettably the failure of William Borradaille’s farming endeavours meant the family fell on comparatively hard times; they moved into rented premises in New Norfolk (Eliza was living here when she met and later wed William Sorell Wilson). Later probably in some desperation to recover his fortunes William Borrodaille went to prospect on the Victorian goldfields around Castlemaine and Maldon but it seems without great success. Fellow researcher Jennie Town has been engaged in research on the WBW and his daughter Eliza for some time, one of the items she has uncovered being the last known letter from WBW back to his family in New Norfolk – it is presented at the foot of this page. The Royal Terrys – Grace Terry’s sister Margaret married one Captain George Frederick Read whose mother Sarah Read is said to have been a ‘favourite’ of George IV, indeed so favourite, that George Frederick is believed to have been George IV’s illegitimate son. So – there’s our Royal link – yes it’s tenuous indeed; but beggars can’t be choosers, and it’s probably the only opportunity we may have, as remote as it is, to claim even a slight hint of association with deep blue Royal blood in at least one arm of the family of Bonnie William. Descendants of William Sorell & Eliza thus may be extremely proud (unless of course you harbour Republican tendencies) – your forebears’ immediate connections (may) have basked, be it ever so remotely and fleetingly, in the glory of the Royal House of Hanover! 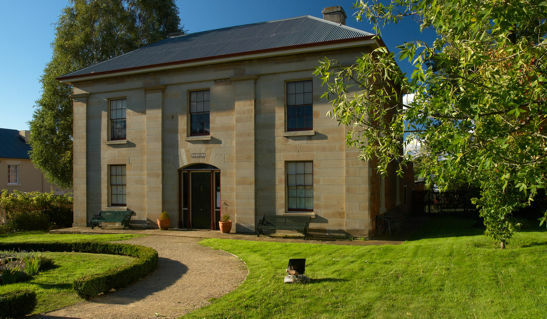 Coincidentally, George Frederick Read and his first wife Elizabeth Driver’s home in Hobart was Narryna, which today is the private museum in which Bonnie William and Margaret’s wedding apparel is housed. The Terry Curse – It seems the Terrys of ancient times did by dastardly means manage to acquire some sort of a curse – and all for the odd misdemeanor like murder and grand robbery, bodies in the bog, hush money, standover tactics and conspiracies of silence. Read more in the story attached below – if you dare! Narryna Museum, Battery Point, Hobart – Royal Household !